Check@UPEI is a Library service that will speed up your research process by helping you locate online and print materials at UPEI. The Check@UPEI button appears in the Library’s article databases when the item is not available in electronic format within the database (or databases) you are searching. If the material is not available through the Library's holdings, you can request the item via Interlibrary Loan. connect to the article if it is available fulltext in another article database(s) to which the Library subscribes. Click on the title of the article to access the full text. Who has access to ? NOTE: Check@UPEI is available for everyone to use within the Library itself. Where will I see the button? Once you have performed a search in most of the Library's article databases, and retrieved a set of results, the Check@UPEI button will display for each citation when the article (or book) is not available fulltext within that particular database. Why don't I get fulltext for some articles? Why is there sometimes more than one link for fulltext articles when I click on the button? The Library subscribes to a number of article databases. In some cases, journal articles are available fulltext in more than one article database. Check@UPEI will then provide you with all relevant links available at UPEI. Why do I sometimes only get to the journal or the publisher site instead of the fulltext article? Unfortunately, it is not always possible to configure the Check@UPEI button to go directly to the fulltext article. Some publishers only allow linking to their journals' main pages, rather than directly to specific articles within the journals. Other times, Check@UPEI can only take you to the tables of contents for a journal issue; from there you will have to navigate to the fulltext article. 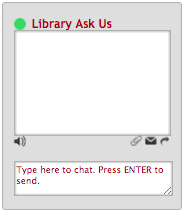 For assistance with using Check@UPEI, please contact the Information Desk in person, by phone at 902-566-0696, by email at reference@upei.ca, or use the Library Ask Us button to contact the Library by Live Chat.